Treat your broken teeth like royalty – with a crown! Crowns and bridges help preserve your teeth that are so worn or damaged that they cannot support normal use anymore. A crown restores the tooth to its normal shape, size and function. The purpose of a crown is to make the tooth stronger or improve the way it looks. A crown is a cover or "cap" that covers the entire outer surface of your tooth. Crowns can be made of gold, porcelain or a porcelain/metal combo. 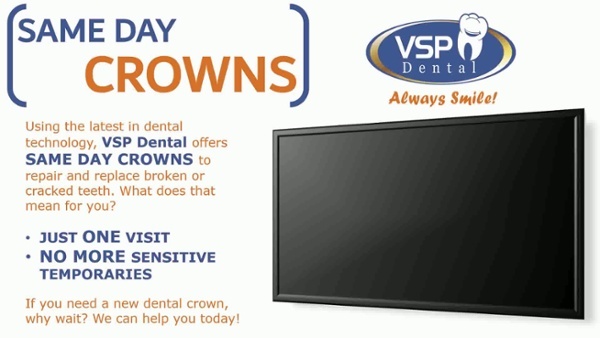 We at VSP Dental prefer full porcelain crowns because they look natural (they’re custom-matched to the color of your tooth) and provide long-lasting strength. Bridges are used to replace two or more missing teeth. They are supported at both ends by crowns on the healthy teeth. A bridge also helps to restore your bite and helps keep the natural shape of your face. want to cover a discolored or badly shaped tooth and improve your smile! The dentist prepares the tooth by removing its outer portion so the crown will fit. Any decay is also removed. If additional tooth structure is needed to support the crown, the dentist may build up the core of the tooth. A 3D scan is taken to provide an exact model for the crown. You will get a temporary crown while you wait for the permanent crown to be ready—usually the same day. While you have the temporary crown, this tooth may be sensitive to hot and cold. Also, avoid chewing gum or sticky foods during this time. The dentist or a laboratory technician then uses the model to help make the crown. When the new crown is ready, the dentist places it in your mouth and makes the necessary adjustments. When you and your dentist are satisfied with how it looks and feels, the crown is cemented in place. Schedule your FREE crown consult today! Meet us, tour our office and get all your questions answered – for FREE! Call us today to set up your free consult at 434-688-0600.